I like this duology a lot. True, I wished the books were a little faster in pace (when you read a lot of YA, you come to expect fast pacing regardless of the story's demands; or maybe that's just me) and sometimes the science fiction oriented writing style (dry and factual) prevented me from 100% sympathizing with Tula and the other characters, but I can't think of another YA series that has such fascinating political intrigue and space opera dynamics. There are so many planets and planetary systems involved in just two novels - though really, it's mostly this novel since the first novel focused more on Tula's growth, aging her from fourteen to sixteen, I believe. And establishing all the planets, their nearby stars and how that has affected plant life, etc. comes into play in examining the dystopia of the Imperium, the universal planetary government that divided all races into Major and Minor Species based on the number of colonies each race has. The world-building and thought behind the galactic struggles is really well done, and the imagination in the design behind the different races and their relationships with one another is admirable. Really, it's a shame that there are so many YA high fantasy novels with similar elements that get more attention than a YA science fiction novel like this that does similar things. I particularly like the theme of intermixing between aliens and humans because a lot of science fiction does seem to have that phobia of aliens, which to me, reads a lot like regular xenophobia as we experience it today. (Or, if you want to be cynical, you could trace "alien invasions" across the history of our world...). Also fascinating to think about are the implications behind Major/Minor Species and colonization. Feels very accurate and applicable to our own world, and yet still so well established in the one that Cecil Castellucci has made for us to enjoy. Intriguing, discussable, well developed. On an unrelated note, when love triangles were *the thing* and some people claimed that they were feminist, providing the oft female MC with choices, I was skeptical; after all, it depended on what the choices meant, the personalities of the romantic interests - not just the choices themselves. But, Stone in the Sky made me think that this is what a feminist love triangle would look and feel like. Loved the romance and the general feel of Tula and Tournour. I'm less a fan of the other coupling, but I do like the idea behind that romance and how Tournour and the other guy don't fight over Tula. Nice character growth all around for Tula and her friends, rather than being mired in romantic angst. Also, the plot was rather unpredictable and the elements worked together fantastically. Exploration among the stars! Looking into the mystery of the human colonies! Why was Brother Blue so cruel to Tula in the first novel? What is his story? What happened to the rest of the human race? What happened to Tula's friends? A gold rush of a previously rare but still valuable plant near to Tula's station - what will happen to her "quiet life" contemplating revenge on Brother Blue on her space station? Why is Tournour exiled on Yertina Feray? And so much more. There are a few unexplained plot events between books such as how Reza ended up in the Outer Rim, when Tula had said in the previous book that she was sending him to Earth - and the same with Trevor, who was supposed to be shipped off with the boys, but I can't begrudge the duology for that because of how everything played out in such a fascinating way. I loved that this book, even while expanding the world and including such interesting plot elements, also kept the same themes of self-discovery and transformation for character growth. A sequel definitely worthy of its predecessor, and an intriguing duology science fiction fans should much enjoy. This review is so helpful. I think I mentioned before how Tin Star was a little too slow for me (I don't think you're crazy, and I don't think it is even just from reading YA, hehe). 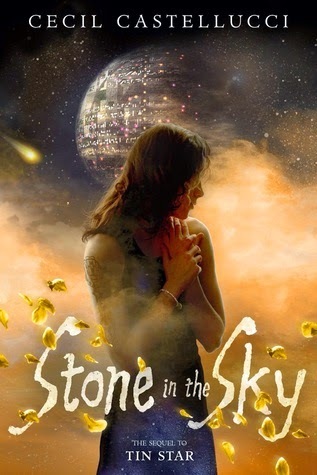 But alien biology and rich galaxy-building and mysteries and unexpected plot twists and and and :D I was going to probably skip Stone in the Sky but I'm convinced to read it now since I think I'll enjoy it. If I still can't get into it, I won't force myself, but I definitely want to try now! I don't especially care for love triangles regardless of how the author approaches them. I've come across 'em one too many times I'm afraid. I'm psyched that you enjoyed this one though, and that Cecil Castellucci delivered the ending to this duology that you were hoping for. That's always a good feeling! Ooh, really? I thought she might. I think she works for the LA Times, but I've been to so few events... True, I do think a lot of people have tired of Love Triangles, though I think some authors do still include them, or, if they do, they're trying to do something different with them (just saw a blurb for a book talking about a bisexual love triangle, which Malinda Lo has done before, but I guess people are commenting more on this other book). The good thing about Stone in the Sky's treatment of love triangle is that at least the main character isn't going back and forth. There's an understanding among all parties involved that's really interesting to read and unique for YA, I think. I'm not normally a fan of sci-fi - I tend to find them dry or too complicated - but I like the sound of the worldbuilding of this one and I'm always a fan of political intrigue. Love triangles are usually a turn off for me too, but again, the one in this one seems well done. I'll have to check this series out. Argh! I said last weekend I was going to reply to blogger comments but then got so stressed out by life events, I missed it. Missed replying to you & visiting blogs! Anywho. Yeah, sci-fi can seem a little dry, and even Stone in the Sky/Tin Star has a bit of dryness to it, but the originality of the world and political intrigue and giving Tula such agency in the love triangle really helps make the duology loads of fun :). If you give it a chance, I hope you enjoy the books!